Under the tutelage of Professor Michael Cox, fifteen promising undergraduate researchers made the trip to present research posters this year. Will Flanigan took the top prize in the Cell and Developmental Biology, Immunology and Microbiology category, and Wenqi Shen earned an honorable mention in Metabolism, Bioenergetics, Lipids, Signal Transduction and Pedagogy. 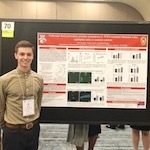 Flanigan is a biochemistry and biomedical engineering major performing research in the lab of Pamela Kreeger, associate professor of biomedical engineering and cell and regenerative biology. In the Kreeger Lab, Will studies ovarian cancer, particularly the DNA mutations and environmental factors that cause it. Shen is an undergraduate major doing research in the lab of chemistry professor Helen Blackwell. She is aiming to understand the roles of quorum sensing during bacterial infection. Quorum sensing is a chemical communication process that allows bacteria to regulate gene expression based on changes in population density and environmental cues, thereby enabling bacteria to coordinate their behaviors on a community-wide scale. Also participating in the trip were: Kamya Gopal and Joe Trimarco (Cox Lab), Jonathan Doenier (Kimble Lab), Emily Hinds (Romero Lab), Sadie Gugel (Carey Lab), Meng Lou (Huttenlocher Lab), Christina McNerney and Lulu Callies and Rezwana Karim (Record Lab), Akshayaa Lakshmana (Attie Lab), Melissa Seman (Catherine Fox Lab), Helaina Von Bank (Pagliarini Lab), and Jennifer Day (Bement Lab). Many of the biochemistry students on campus are involved in the ASBMB student chapter, which serves as a resource for students wanting to get involved in research and get the most out of their education in biochemistry or related fields.